Markham Biotin (Sulfate Free) Shampoo - All Markham Shampoos are sulfate free, lather luxuriously, cleanse gently and rinse instantly, leaving the hair healthy looking and manageable. Whether your hair is dry, normal or oily; weather you suffer from dandruff; or if your hair is colored, bleached, grey or white, Markham has the perfect shampoo for you. Markham Biotin Conditioners - To complement the appropriate Markham shampoo, Markham has formulated a full line of conditioners, with one being just right for you. All Markham conditioners are specially formulated to tame tangles, remove static electricity and to provide sheen and body for specific hair types. Markham Biotin Repair and Prepare Intensive Conditioners - All Markham Intensive Conditioners are formulated to repair and prepare the hair for perms, color and treatments. The use of these conditioners results in optimum performance of any chemical treatment while improving the condition of the hair. 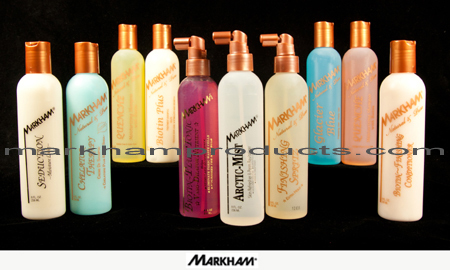 Markham Styling Aids (Hair Sprays / Gels / Oils) - All Markham styling aids can be used singularly or cocktailed in any combination to create the finished look you desire.